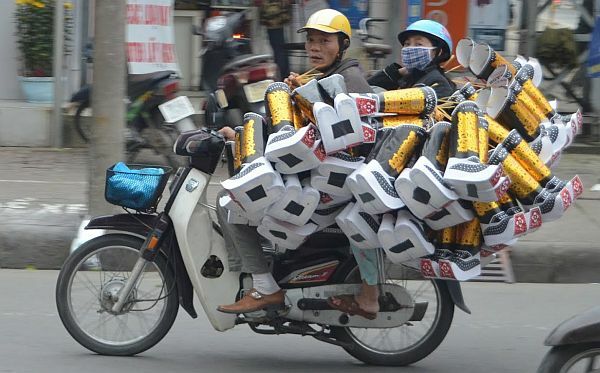 Throughout Vietnam, it’s easy to see how scooters and motorcycles have moved with the times. On weekday mornings in HCMC, men and women in business suits, masked against the pollution, rule the streets, but at night and on weekends, families of three four, sometimes five, take over, smiling and riding freely into the late evening, through sun and rain. In Dalat, a city in the interior mountains created by French mandarins in the long years of occupation, the sound of shifting gears fill the air as riders ferry the region’s fruit, vegetable, coffee and livestock through hills that circle the city. In the historic city of Hue, home of the last emperors of Vietnam, I spotted a motorcycle hidden under its loads of boots, knowing it was headed to the Imperial City where Vietnamese tourists love to pose in costumes that the Emperors and their concubine wore in the pre-Communist time. And in the fertile land of the Mekong, I saw women who now could easily ride the long distances from home to rice paddy where they could now work longer days and increase the family income. Finally, in the coastal city of Hoi An, I knew I’d found a place where I could be more than an observer. Hoi An, with saffron-colored buildings dating back to the fifteenth century filling its World Heritage center, is possibly the most picturesque city in Vietnam. It is also the easiest city to negotiate since cars are banned from the ancient core. More importantly, for my purposes, it has a population of about 30,000 people compared to Hoi Chi Minh City’s roughly eight million. In HCMC, the city seems to never stop; in Hoi An you can be out of town in a flash. I waited until our last full day. I woke up knowing that if I didn’t get on a scooter in Hoi An I wouldn’t get on one in Vietnam. On the web you can find stories of people ripped off when they rent scooters or motorcycles in the bigger cities. Apparently the scam goes like this: you are given a key so you can park the bike; someone with the same key comes along and takes the bike and you are accused of losing it. In Hoi An, I rented my scooter at a restaurant where we’d eaten the evening before with locals. The owner seemed to recognize me and I figured he’d know I had someone who would fight for me. For less than five dollars, he said I could use the only scooter he had, a black Honda that tried to look like a motorcycle. He put some gas in the tank, gave me a city map and a helmet. 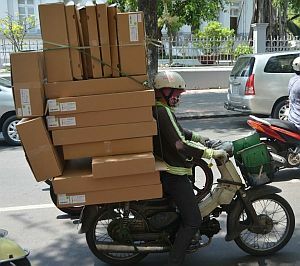 While the Vietnamese government has made helmets mandatory — at least for adults — it clearly did not develop any standards. There was no label on my black helmet; it looked like a leftover from a war. With trepidation, I made my first turn on to a major road and from that point on it was golden. I smoothly entered the flow of bikes swirling around a roundabout and headed off on a road I thought would take me toward the ocean. It didn’t take long to leave the tourists and the shops selling silk and tailoring behind. I passed schools and houses and a meeting room where Buddhist youth were chanting. In the countryside, I whizzed past rice paddies and water buffalo, honked at two girls on bicycles blocking my path as locals riders do. I had to stop twice to tighten the helmet that threatened to fly off my head. But no matter how tight I pulled it always swung wildly, offering no protection at all. When I finally reached the beaches I considered walking on the sand, but a young man wanted me to pay for parking and I didn’t want to stop. I rode back to town and turned a different way, riding out past the food and cloth market, past the high-end riverside resorts to a rural road where villagers shopped at a small market for rice noodles, meat and t-shirts. Usually, I’m a sucker for every photograph I can get but I didn’t take any this time. I just wanted to enjoy the speed, the changing tableaus, wanted to feel as though I was part of the movement of those traveling beside me. After a couple of hours I had tried every different road I could find out of the city. I had mastered the art of moving through intersections with no lights and no stops — it involved a lot of holding my breath. 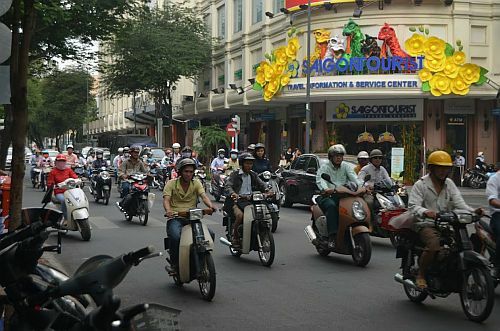 I could not however bring myself to turn left Vietnamese style, so each time I wanted to turn left, I rode past where I wanted to turn, stopped and crossed the road when I could and pointed my scooter in the other direction before heading back into traffic. One time when I did this, a group of school boys watched me with bewilderment. I was grateful I didn’t understand their Vietnamese words. As I headed back into town I had to stop at a rare traffic light. Two men on a motorcycle pulled up beside me. They had the clothes and the dark skin of men who worked outside and when they started to point at me I wondered, unfairly, if I was in for my first bit of trouble. But as the light changed and we both accelerated they smiled widely with thumbs up. I smiled back and left them in my dust. I love Vietnam and miss it like crazy, especially HCMC.